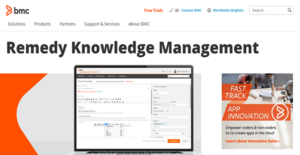 What is Remedy Knowledge Management? Remedy Knowledge Management is a mobile service desk and information database. You can use it to write articles from scratch or create them using templates. The application even lets you curate knowledge from third-party sources to expand your repository. Remedy Knowledge Management lets you resolve issues faster as employees have relevant resources within their reach. This enhances your services and makes your customers happier. Moreover, Remedy Knowledge Management cuts down the number of calls your support center receives. This paves the way for the service team to receive critical communications. On top of that, pushing self-service content empowers your users and lets them find solutions to problems expeditiously. With Remedy Knowledge Management, you enable your knowledge base team to create articles wherever they are or on their preferred mobile devices. The module is user-friendly and is equipped with templates you can utilize to jumpstart your knowledge base building. Remedy Knowledge Management has embedded social engagement tools that let readers comment, flag, and write their favorite articles. Using this info, your knowledge base team can improve content for better updates. The search capability of Remedy Knowledge Management is a powerful one as it uses natural language processing. With this, it can understand users’ search terms to retrieve information that is relevant to them and not come up empty. For a truly comprehensive knowledge base, it is important that you have answers to every possible query related to your products and services. Remedy Knowledge Management enables you to do this by affording you the ability to connect with third-party data sources that can help your audience find the solutions they need. Searching and browsing are not the only ways for your users to retrieve articles. Remedy Knowledge Management comes with a virtual agent that employees and customers can chat with interactively. This helps them find or narrow down search results for them to get the resolution that is relevant to them rapidly. If you are interested in Remedy Knowledge Management it might also be sensible to examine other subcategories of Best Knowledge Management Software collected in our base of B2B software reviews. Since each company has specific business wants, it is sensible for them to abstain from seeking a one-size-fits-all faultless software application. Needless to say, it would be pointless to try to find such a system even among popular software solutions. The smart thing to do would be to jot down the various essential factors that require consideration such as required features, finances, skill levels of employees, company size etc. Then, you should do your research thoroughly. Read some Remedy Knowledge Management reviews and check out each of the other systems in your shortlist in detail. Such comprehensive research can make sure you reject ill-fitting applications and choose the solution that provides all the elements you require for business success. How Much Does Remedy Knowledge Management Cost? Remedy Knowledge Management brings information closer to your workforce. It forms part of the BMC Remedy Suite though you can acquire it bundled with Remedy Service Desk or Remedy Service Optimization. For tailored enterprise pricing, you can get in touch with the sales team by phone or email, or you can express your interest in the website’s contact form. We realize that when you make a decision to buy Knowledge Management Software it’s important not only to see how experts evaluate it in their reviews, but also to find out if the real people and companies that buy it are actually satisfied with the product. That’s why we’ve created our behavior-based Customer Satisfaction Algorithm™ that gathers customer reviews, comments and Remedy Knowledge Management reviews across a wide range of social media sites. The data is then presented in an easy to digest form showing how many people had positive and negative experience with Remedy Knowledge Management. With that information at hand you should be equipped to make an informed buying decision that you won’t regret. What are Remedy Knowledge Management pricing details? What integrations are available for Remedy Knowledge Management? The Remedy Suite can readily integrate with other BMC products. For third-party integrations, you can ask for more information from the support team. If you need more information about Remedy Knowledge Management or you simply have a question let us know what you need and we’ll forward your request directly to the vendor.